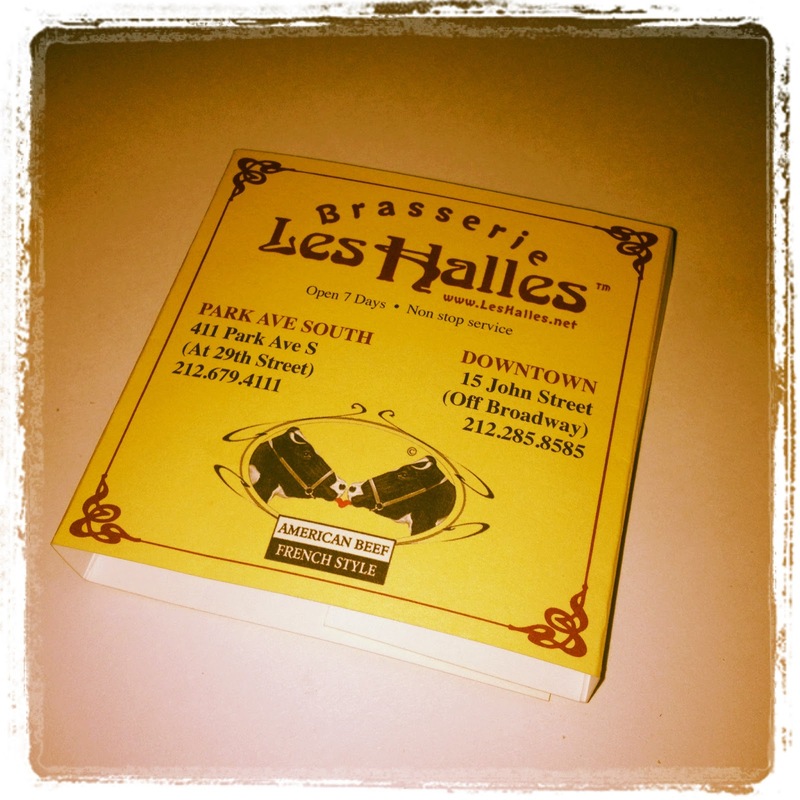 Neither Rain, Nor Snow, Nor Tornado Warnings Could Keep us from Les Halles…. Ummm. It’s Foodies In NYC night! Of COURSE we’re not at home. We were at Les Halles and we were not going to let a little drizzle (read: downpour) or wind (read: tornado warnings) keep us from spending an evening at the famed French bistro. I had recently finished reading Kitchen Confidential, by the rough-around-the-edges chef Anthony Bourdain and had to try his old stomping ground (I’m told he still consults for LH as the “Chef at Large”). Of course, I brought my girls along for the ride, who were already big Bourdain fans – who do you think gave me the book? 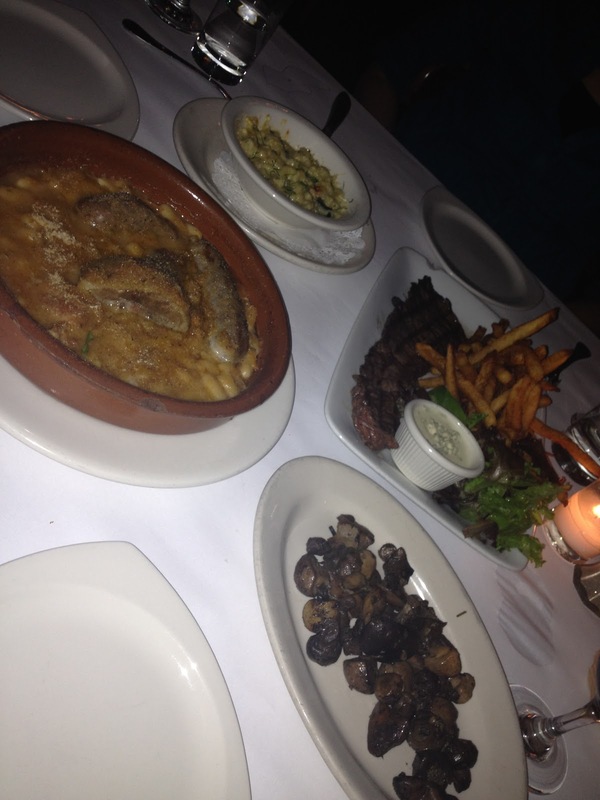 Cassoulet, Mushrooms, Mac 'n Cheese and Steak Frites! We started the evening with Croûtons de Coulommiers rôtis au Miel et Poivre – for those who don’t parlez-vous Francais, it’s roasted brie with honey and cracked black pepper over frisée salad. The creaminess of the brie, the sweetness of the honey and the bite of the black pepper was fantastic. Though, as much as I love a salad, I can’t stand frisée. It feels like the lettuce is fighting in my mouth. Christa disagreed – she thought it added a great crunch to offset the smoothness of the cheese. 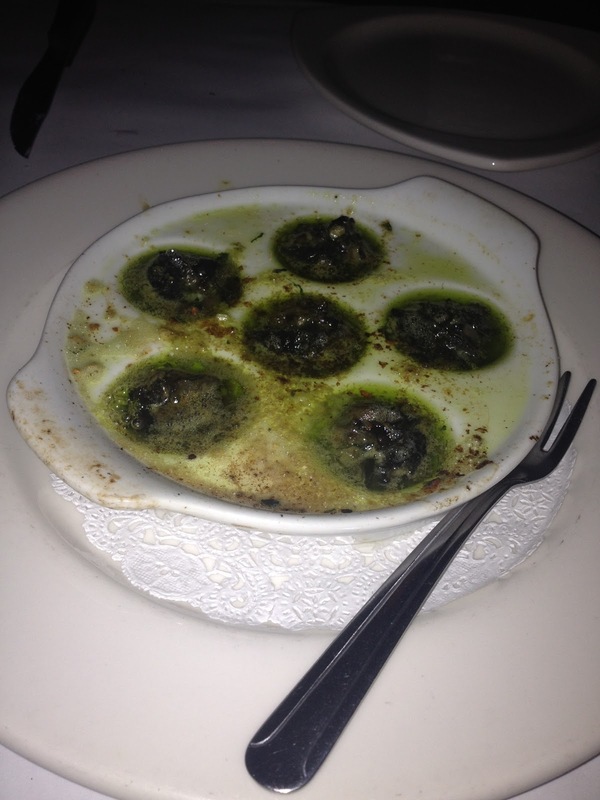 The girls also ordered escargot. 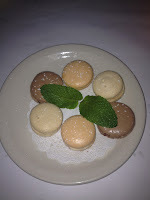 While I’m not a fan, I’m told they were delicious. I can tell you from the freshly baked bread I dipped into the hot butter and garlic that the little fellas were swimming in that they were well seasoned! Now on to dinner. 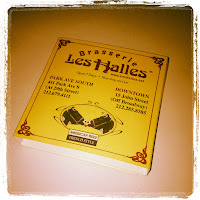 HOW can one go to Les Halles and NOT get steak frites?! We selected the skirt steak with blue cheese and the Cassoulet “Toulousain.” Both were great. I was surprised how tender the steak was and how well the blue cheese complemented it without overpowering. However, the cassoulet could have been ALL we ordered and we would have left the restaurant fat n’ happy. The only sub-par item we ordered was the truffle mac and cheese. It was a little dry and did nothing for us. Since it was my pick and I have the biggest sweet tooth of the group – of COURSE we were getting dessert! 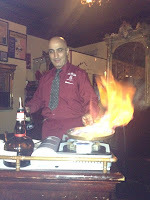 Homemade macaroons and bananas flambé presented table side. Great way to end our dark and stormy night! The Take Away: This is the perfect place for French-inspired comfort food. The staff was attentive – the manager took it upon herself to refill our bread and water glasses when she saw we were running low. The waiter – while busy – took the time to give us a show with the bananas flambé. Merci beaucoup Halles! Nous reviendrons!